It would take an act of the Texas Legislature to legally establish my grandfather’s existence, including when, where and to whom he was born. There’s nothing normal about his birth certificate. Gus Roberts was born August 24, 1898 on a farm in Lamar County, Texas eleven miles north of the community of Brookston. That’s the kind of information you normally obtain from your parents sometime after you’re old enough to remember. But less than a month after granddad’s third birthday, his father was dead and his mother was in jail! It would take a County Judge named Eugene F. Harrell to establish the facts of Gus Roberts’ birth. His decision was adjudged and decreed two months shy of granddad’s’ forty-fifth birthday in 1943! I imagine my grandfather needed a birth certificate long before 1943 and it was probably problematic and annoying not having one. This is evidenced by the rapidity with which he obtained one when it became legally possible. 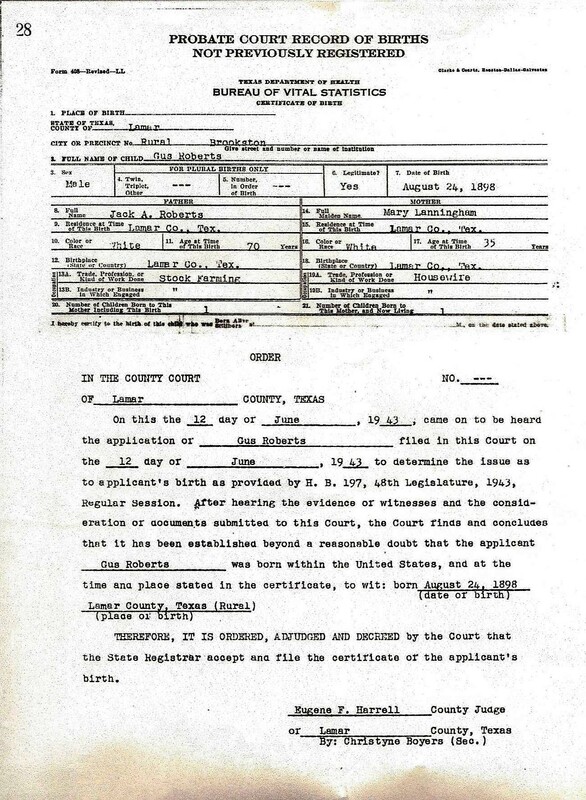 The Texas law, HB 197, passed and signed by Governor Coke R. Stevenson in March of 1943 allowed grandfather to take his case to a county court, prove who he was and obtain an official birth certificate and have that record registered with the State Health Department. He obtained his legal hearing and his “official existence” in a Lamar County courthouse on the same day, Saturday, June 12, 1943. This official Texas birth record contains a number of facts related to my grandfather. Some of them are more certain than others and some are certainly incorrect. Let’s look at the record and compare it to what we know or suspect. You may click on the image to enlarge it. His name – The full name of the child is “Gus Roberts” I believe this is correct and I’ll have more to say about it in a future post. He was a male. His birth was legitimate and occurred on August 24, 1898. – Due to some testimony around his father’s death, there was a question concerning his paternity. His father and mother married two years before his birth in 1896. And though my great-grandfather was over twice my great-grandmother’s age, I’m related to both of them by the wonder of DNA. Legitimate. His father’s full name is given as Jack A. Roberts. This most certainly is incorrect. I don’t mean he wasn’t called by this name or a variant of it and I don’t mean his son, who was only three when he died, didn’t know him through others as Jack A Roberts. What do I mean? There is a large body of evidence my great-grandfather’s name was John Anderson Roberts. John Anderson’s father, my great-great grandfather’s name was John Rivers Roberts and there’s evidence he went by Johnny, John Rivers or John R. This may have been to distinguish himself from his father who was also named John Roberts. Perhaps John Anderson was known as “Jack” from his childhood. I don’t know. I do know his neighbors in Lamar County knew him as “Jack”, “Jack A.”, “Jackie” and/or“Uncle Jackie”. His father is described as a white male, age 70 years at the time of Gus’ birth. This is only half right. He was white. He was not 70. 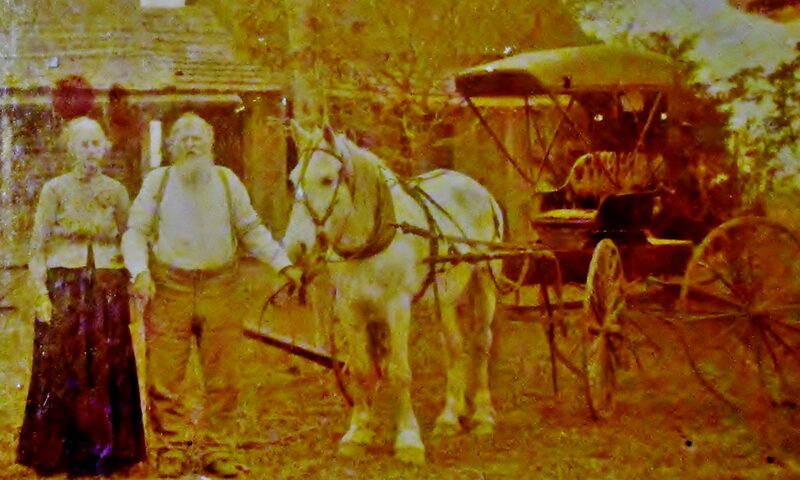 He was born in March of 1830 in Williamson County, TN. He would have been 68 years at the time of his son’s birth. Impressive. His mother’s full maiden name is given as Mary Lanningham. When she married John Anderson in 1896, the name on the marriage license was Mrs. Mary Thompson. I have been unable to uncover the details of Mary’s previous marriage. I do know there were a number of Thompson men as candidates on or near the Emberson Prairie of Lamar County. Based on my research, I believe her family name was originally Van Landingham. Her Texas family spelled their surname without the double “n”, as in Laningham by the time her son Gus was born. And though I do not know what the “L” represents, I believe her name could be more fully rendered Mary L. Laningham based on a census record from 1880. Gus’ mother is described as white and age 35 years at the time of his birth. I suspect this again is only half right. Yes, she was white. No, I don’t know how old she was for certain but suspect she was born in 1871 and would have therefore been closer to age 27. I plan to do a post explaining my conclusion in the future. The number of children born to this mother including this birth and the number of children living at the time of this birth is one. If this is correct, it would mean Gus was Mary’s only child prior to her time in prison. I’m not concluded my “reasonably exhaustive research”. Before I can assess the reliability of this testimony, I need to research the probate records for this hearing and learn who testified or provided affidavits in 1943. Sounds like another trip to the Lamar County courthouse.! Thanks for reading the blog and feel free to share your “birth certificate stories”. Click the “Follow” button on the blog or Facebook page and never miss being notified of new posts. Hi Gary, I’m laughing and smiling all the way through this post. I am having similar difficulties deciphering some of the “facts” surrounding several documents of those in our family. We have one fellow who for reasons yet uncovered, changed his name and left a trail of wives and children behind; this fellow married into our family three wives and two children later. Imagine working from back to front trying to find this guy. But, I did it. Great post, Happy hunting! Thanks for the comment! You made me smile…and laugh as I thought, “Better you than me.” Thanks for sharing.